October 2012 was the fourth consecutive month in which the Audi A5 outsold the Chevrolet Camaro. No, they’re not direct rivals. One is a $46,900-$77,000 all-wheel-drive German GT. The other is a $28,200-$64,250 rear-wheel-drive American muscle car. But the fact that the more expensive German luxury car is routinely outselling the theoretically more mainstream sporty car suggests a trend our American neighbours know nothing about. South of the border, the Camaro sold nearly four times for every A5 in October. Not only is the A5 capable of periodically (or usually) outselling rare cars like the Chevrolet Camaro, Scion FR-S, Hyundai Genesis Coupe, and BMW 1-Series, it’s also a hugely important car for Audi. 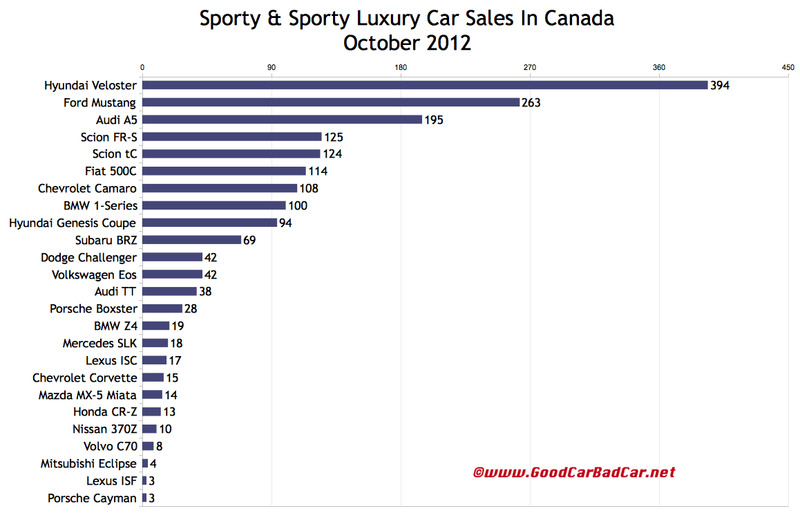 The 1-Series, for example, was responsible for just 3.6% of all BMW Canada sales in the first ten months of 2012. Volume-wise, the Mustang plays a small role for Ford, accounting for just 2.1% of all Ford Canada sales this year. The Genesis Coupe brings in just 1.4% of Hyundai buyers. But one in ten Audi Canada sales is an A5, S5, or RS5. Elsewhere at the VW Group, the Volkswagen brand continues with its new strategy of hiding GTI and R sales within the Golf’s total. That’s hugely frustrating, but it’s not uncommon. You won’t see the Civic Si, Focus ST, or MazdaSpeed 3 listed here, either. 12.6% of the Golfs sold in 2011 were GTI variants. 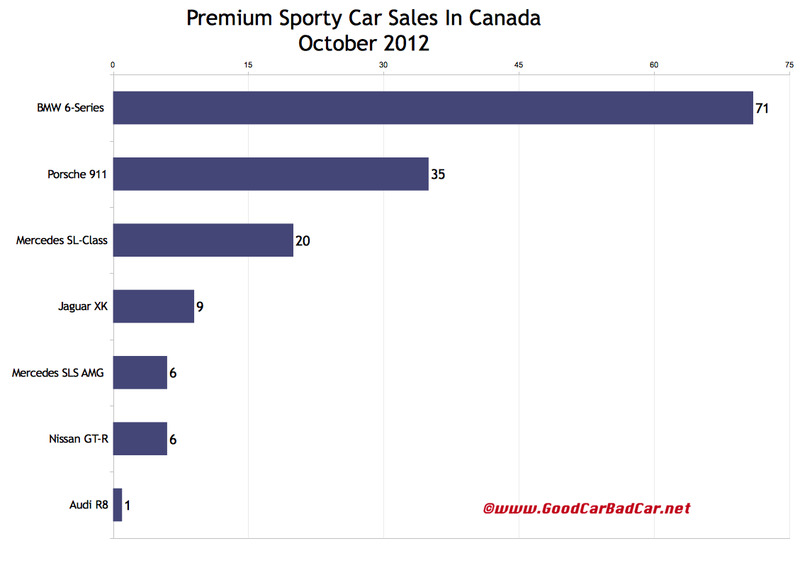 Based on that figure, we can estimate around 163 GTI sales in October 2012. 160 were sold at this time last year. Porsche sold 35 911s in October 2012, a 59% year-over-year increase. That takes the 911’s total up to 528 through the first ten months of 2012, a 14% improvement over 2011’s year end total. In fact, Porsche Canada hasn’t sold this many 911s in a full calendar year since 2007. As we always say, historic brand and corporate totals (monthly and yearly going back to 2004) are now available through the dropdown menu at GCBC’s Sales Stats page, along with results for more than 260 currently sold vehicles. That’s where you’ll find out that Chevrolet sells 31 times as many Camaros in the U.S. as Chevrolet does in Canada. Ford sells 15 times more Mustangs. Dodge sells 26 times more Challengers. After the jump you’ll find detailed October 2012 and year-to-date U.S. sales figures for a number of wildly different sporty vehicles. If the vehicle you’re looking for isn’t grouped together with these premium-priced vehicles, it may be listed in the small/entry luxury car category, the small car category, or any other segment you can access through the eighth dropdown menu on GCBC’s Tally page. Next What Can The Fiat 500L Do For Fiat USA?